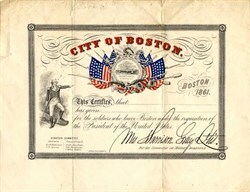 Beautifully printed partially certificate from the City of Boston dated 1861. 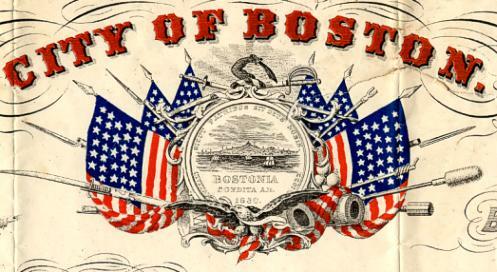 This historic document was printed by J.E.Farwell & Co. and has an ornate border around it with a colorful vignette of American flags, cannons, bayonets, and swords. This item was signed by Mrs. Harrison Gray Otis and is over 146 years old. Some signs of wear on the folds.